(Nanowerk News) Compact, sensitive and fast nanodetectors are considered to be somewhat of a "Holy Grail" sought by many researchers around the world. And now a team of scientists in Italy and France has been inspired by nanomaterials and has created a novel solid-state technology platform that opens the door to the use of terahertz (THz) photonics in a wide range of applications. During the past decade, materials research has played an essential role in filling the THz gap, beginning with the development of THz quantum cascade lasers, which rely heavily on semiconductor heterostructured artificial nanomaterials. The development of THz spectroscopy, nanospectroscopy and THz imaging expanded the range of powerful tools for the characterization of a broad range of materials -- including one-dimensional or two-dimensional semiconductors, biomolecules and graphene. As the scientists report in the journal APL Materials ("One dimensional semiconductor nanostructures: An effective active-material for terahertz detection"), by using an approach that exploits the excitation of plasma waves in the channel of field-effect transistors (FET), they were able to create the first FET detectors based on semiconductor nanowires, designed in a plethora of architectures -- including tapers, heterostructures and metamaterial-antenna coupled. While they were at it, they also developed the first THz detectors made of mono- or bi-layer graphene. 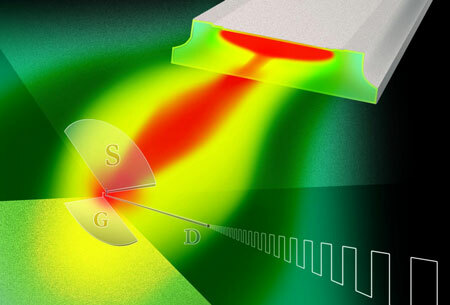 "Our work shows that nanowire FET technology is versatile enough to enable 'design' via lithography of the detector's parameters and its main functionalities," explained Miriam Serena Vitiello, lead author of the paper as well as research scientist and group leader of Terahertz Photonics Group in the Nanoscience Institute at CNR and Scuola Normale Superiore in Pisa, Italy. What's the nanowire detector capable of? It offers "a concrete perspective of application-oriented use, since it operates at room temperature -- reaching detection frequencies greater than 3 THz, with maximum modulation speed in the MHz range, and noise equivalent powers that are already competitive with the best commercially available technologies," Vitiello said. In terms of applications, because the nanodetectors can be tapped for large-area fast imaging across both the THz and the sub-terahertz spectral ranges, don't be surprised to see them commercialized in the near future for a variety of spectroscopic and real-time imaging applications -- possibly even in the form of fast multi-pixel THz cameras. Next, the scientists' goals are to "push the device's performance in the ultrafast detection realm, explore the feasibility of single photon detection by using novel architectures and material choices, develop compact focal plane arrays, and to integrate on-chip the nanowire detectors with THz quantum cascade microlasers," noted Vitiello. "This will allow us to take THz photonics to a whole new level of 'compactness' and versatility, where it can finally begin to address many killer applications."